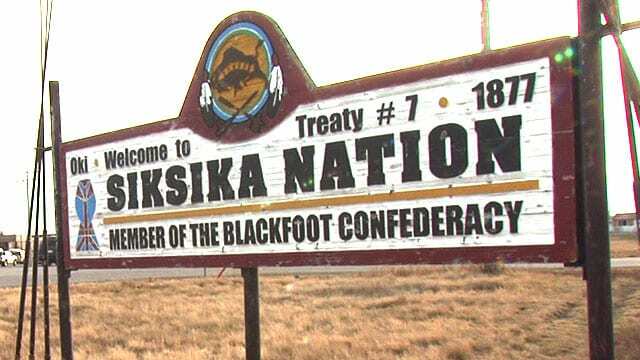 Sign outside Siksika Nation (APTN file). The Siksika Nation in southern Alberta is appealing for calm after two men from nearby Strathmore were charged with first-degree murder in the killing of a band member this week. “The investigation is ongoing and we will respect the due process that it entails,” says a statement from chief and council. RCMP say Christian William White, 24, was found shot to death inside a vehicle near the intersection of Highway 817 and Highway 22X about 3:30 a.m. Sunday. There is also a joint post from the band council and Town of Strathmore saying they are united in grief for White. “He was loved and respected by his community, the Siksika Buffaloes Senior AA and the Strathmore Wheatland Kings hockey teams,” the post says. The statement notes both councils have met together in the wake of the violence to discuss ways to heal their communities. Another post says family members of friends of the victim have requested privacy at this time. Kody Allan Giffen, 22, and Brandon Daniel Giffen, 25, are charged with first-degree murder.